Google Doodle commemorates today the birthday of Virginia Woolf. Something is changing in our world. This is one of the first Modernist writers, hated and believed to be a crazy, ill or lesbian writer by some of their contemporaries, most of them not always writers, but upper-class English and European elite -admired nobleman and women who didn't understand what Virginia Woolf (from an upper class, too) was decades in advance saying-, away from those who said with ease she was a smoker and a poor writer. Fortunatelly, she demonstrated the contrary, writing such relevant essays as "A Room Of Her Own's," and many other books, essays and novels that were more futuristic than photography itself: some of her novels, like Mrs Dalloway, seem to be a read film in black and white, sometimes in colors, sometimes like our own thinking, and the thoughts of others together. If you take steadily attention to the stream of counsciousness she followed, you will realize she just wrote on a book what we all feel: the relativity of time, the memories we had and things we are thinking, as well as the sudden things that are happening around us. Different characters in the same place, or not. Kwown characters thinking about others, about their own past, present and future. At the same time, the classical characters that were there like spirits (a lady with an umbrella or with a light near a party in the back of a house.) Are the flowers more important than the sounds from the man suffering from a postraumatic stress because of the war? Is it just a connection between friends and lovers, a re-encounter, as described in Mrs Dalloway? Other works like To the lighthouse started other worlds in my own mind years and years ago, so now, I do not know if I should call this Modernism or Virginian Woolfian Postmodernism. 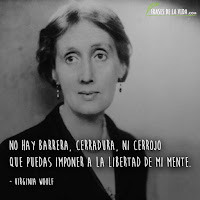 In fact, Virgina Woolf was so intelligent and delicate at the same time (too respectful to others, if you let me say,) that her writings are still at present-time, bringing a special and meningful light, like planets and stars which are far away in those places the human being has no full or little ability to understand yet. My best regards for all the friends who discover V. Woolf's inner kind of magic writing, no matter if they find her feminist, modern, rare, confussive or innovative.